A dramatic high-speed police pursuit up I-95 in Miami-Dade ended with two suspects in custody following a brief foot chase Wednesday morning. The chase began shortly before 7 a.m. near the Starbucks at 6815 Biscayne Boulevard in Miami. Police say an off-duty firefighter was at the coffee shop and witnessed what he believed a robbery. He called 911 and followed the car giving police it's location. Police began following the two armed robbery suspects who were in a white Toyota sedan. The pursuit headed northbound on I-95 with officers following the car, which was speeding and weaving in and out of traffic. A dramatic chase that began in Miami ends in Miami Gardens with a suspect who was running through a neighborhood taken into custody at gunpoint. Witness Linnette Ellis and MIami Gardens Police spokesman Carlton Coleman comment. The driver of the car lost control and crashed into a guardrail on the ramp to the Florida Turnpike at the Golden Glades toll plaza. One of the suspects was taken into custody nearby. 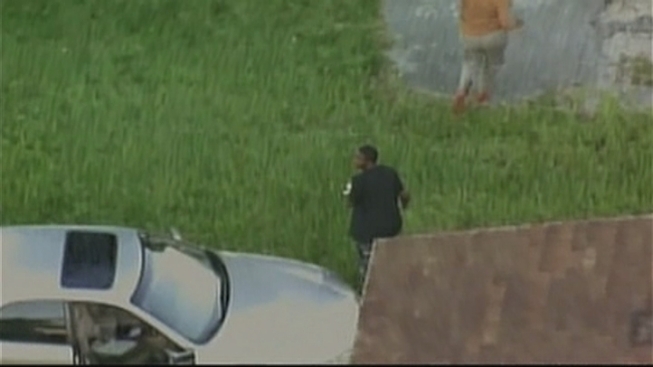 The other suspect jumped a fence and ran into a residential neighborhood in Miami Gardens. The suspect, who appeared to be carrying a wad of cash, ran up to a woman who was getting into her car. "I saw him running through the yard and then towards me. He had cash in one hand and holding up his pants with the other. I couldn't tell if he had a gun," said the woman, who only wanted to give her first name, Maryland. "He said 'give me your keys! Give me your keys!' I just backed up. I ran over to my neighbor and yelled for her to get the gun. He took off." At one point, he approached another person who was leaving their house, but the person was able to run back inside. "When I looked through the window I saw a guy running across here, like he was putting something in his pocket," resident Linnette Ellis said. "It was shocking." The suspect was walking down the street when an officer approached and took him into custody at gunpoint. It's unknown what charges they'll face. City of Miami, Miami-Dade and Miami Gardens Police were all at the scene Wednesday. "The officers did a good job in apprehending these suspects, getting these dangerous people off the street," Miami Gardens Police spokesman Carlton Coleman said.